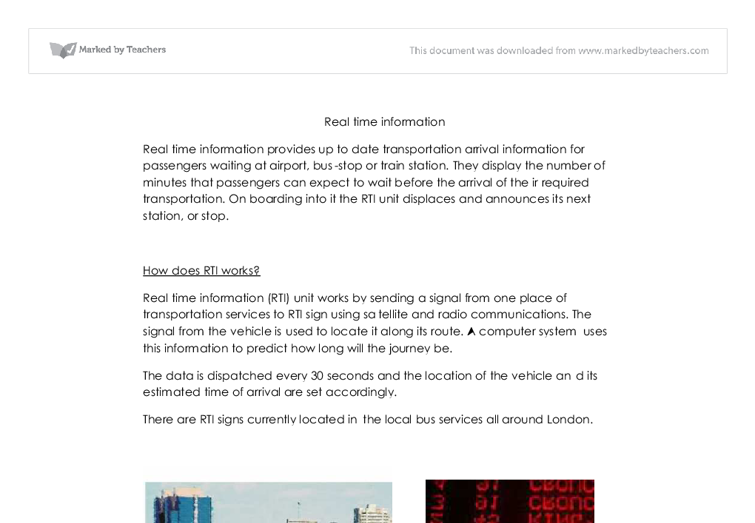 Real time information Real time information provides up to date transportation arrival information for passengers waiting at airport, bus-stop or train station. They display the number of minutes that passengers can expect to wait before the arrival of their required transportation. On boarding into it the RTI unit displaces and announces its next station, or stop. How does RTI works? 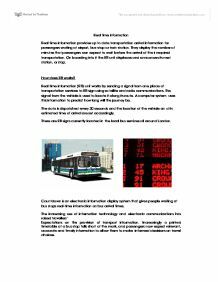 Real time information (RTI) unit works by sending a signal from one place of transportation services to RTI sign using satellite and radio communications. The signal from the vehicle is used to locate it along its route. A computer system uses this information to predict how long will the journey be. The data is dispatched every 30 seconds and the location of the vehicle and its estimated time of arrival are set accordingly. ...read more. Such systems usually base their predictions on the actual locations of vehicles combined with timetable database. For example: if we want to look up for the train to go Kingston station this afternoon, in the network rail website we can find a number of information, by means of postcode or the name of the station, subsequently we can also obtain the entire information, of arriving and departing of the train. We can also find information's about what route we want to take for it has shown the full map view of the particular place starting from the station. It has also given us information about the ticket fare and also includes various information, such as: ticket fare for pick up and off seasons, means to buy the ticket online. ...read more. * We can book specific seats free of charge. * We can enjoy extra services. Drawbacks of using this kind of service online: * We cannot ask further information. * We can't do online booking if we don't have any access to Internet. * We cannot trust the website easily. * Can take a while to start up and can be difficult to learn at first. * It might be complex for some people. Similar services are available outside those are not available on the internet: If we didn't have supply of internet or no e-ticketing facilities we can go up to the ticket office, the airport itself or go to the agency and get a ticket. Same process could be followed in case of train as well. We can go to the ticket office in stations and get the ticket. We can also get trains ticket form shops sdmsladjlsjdasl286 180 188 199 ...read more. In summary, the report is quite basic. The report does describe how data is is updated in real time using a number of methods. However the report is lacking detail and case studies which would link the background research to an commercial environment. The report states a user is able to use the internet to find information regrading the service on that day. However the report doesn't give any examples/case studies of websites which pride this service. For high marks, the user could undertake this process, and show a website which provides the information. The report states how a display unit can update, using either a satellite or radio signal. Although doesn't explain, why this is useful. The report could include 'The benefit of using either the satellite/radio, is that a person is able to update the situation quickly within their office. As there would be able to gather information on how the system is coping, and if the train is late, this information can be received quickly in the office, and displayed using one of two signals quite effectively'. The report states the term 'RTI' and gives a detailed description. This is quite good, as this shows a clear understanding of this technical term. The report is quite presentable, with three images within the report. This allows the examine to visualize the report, which is useful and effective. Often the way in which data is held and manipulated within an organization is inefficient or wasteful, so a computerized system is developed to replace a manual storage system, or to replace an inefficient computerized system. In other words, if there is a better and more cost-effective method of handling data, businesses will obviously want to use that method! Therefore there are no 360� views because this would be pointless as the main product is only a DVD disk, where only the movie is important. Therefore there are only 2D images of the front cover. The overall product description is very detailed and provides customers with a lot of information about the film. Websites can be either a liquid layout or a static layout. A liquid website is when the size of the website adjusts to the resolution on the viewer?s screen ensuring that it is always ?full screen?. A static layout for a website will make the website remain the same size regardless of screen resolution. which they could use in some way, such as getting money, they may be tempted to use it. The final group are probably the most dangerous group as they hack with the intention of using the information in an illegal way. Probably the most common crime would be identity theft. The diagram below shows this: When the signal arrives at the receiving end of the transmission, a modem then converts this analogue signal back into a digital signal which the transmission device (usually a computer) can understand. This is how modems modulate and demodulate. Hain (1986) argues in spite of this, that the system results in two 'classes' of MPs: half who have been chosen by the electorate, and half chosen by the party. This could result in resentment of party MPs by those who had to campaign for their posts and claims of greater legitimacy. have access to a computer at home then they are forced to give up their lunch times to do the work at school. This is unfair and creates obstacles for certain people in the community. This is similar to other countries in the more economically developed world.